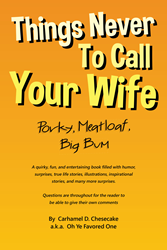 “Things Never to Call Your Wife: Porky, Meatloaf, Big Bum”, from Christian Faith Publishing author Carhamel D. Chesecake, is an entertaining read that tells of laughable and thoughtful moments that exude with vibrancy and inspiration. “Things Never to Call Your Wife: Porky, Meatloaf, Big Bum” engages the readers through a journey of life and emotion. “Things Never to Call Your Wife: Porky, Meatloaf, Big Bum” is the creation of published author, Carhamel D. Chesecake, an author with a bachelor’s degree in business administration and a master’s degree in the School of Hard Knocks. Published by Christian Faith Publishing, Carhamel D. Chesecake’s new book presents a unique way of reaching out to the readers while conveying life lessons that they can heed and ponder. This magnificent work features numerous anecdotes, illustrations, photos, secrets, and thought-provoking questions throughout. View a synopsis of “Things Never to Call Your Wife: Porky, Meatloaf, Big Bum” on YouTube. Consumers can purchase “Things Never to Call Your Wife: Porky, Meatloaf, Big Bum” at traditional brick & mortar bookstores, or online at Amazon.com, Apple iTunes store, or Barnes and Noble. For additional information or inquiries about “Things Never to Call Your Wife: Porky, Meatloaf, Big Bum”, contact the Christian Faith Publishing media department at 866-554-0919.